After two consecutive stellar seasons at wide receiver, UMR senior Ashton Gronewold has earned numerous pre-season honors for the 2007 football season. Miner track and field standout Tyrone Smith finished 14th in the long jump competition during the 2007 Pan American Games held in July in Rio de Janiero, Brazil. Thomas McCormick, an outfielder for the Miner baseball team, was named as the recipient of the Mike Schmidt most valuable player award for the 2007 season as a member of the Quincy Gems of the Central Illinois Collegiate League. Joe Ahearn, former assistant coach at Colgate University, has been named as the new UMR men’s soccer coach. He takes over for Vince Darnell, who resigned to pursue other career opportunities. For the second consecutive year, senior swimmer Bill Gaul, ChE’07, was named Player of the Year on the ESPN The Magazine Academic All-America team. It is the third time in the last four seasons that a UMR swimmer has earned this top academic award. 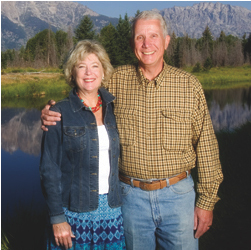 For Ray Betz, CE’66, and his wife, Susan, reputation is key – UMR’s reputation, that is. On Thursday, April 19, UMR Chancellor John F. Carney III announced the launch of the largest capital campaign in the institution’s history. Titled “Advancing Excellence: The Campaign for the University of Missouri-Rolla,” the goal is to raise $200 million by June 2010 to achieve the university’s vision of becoming a top five technological research university. To date, the effort has raised more than $115 million for UMR students, programs, faculty and facilities.